Hope you all are doing great! I am doing wonderful; I finally figured out how to take great pictures myself with the my Tripod. I normally take the pictures in the evening when the sun is a bit down. But today, I took the pictures in the afternoon when the sun was still out and bright. The pictures turned out really beautiful as you will see below. On to my outfit, I wore this to run errands with my mom for my brother's graduation. Mint is such a huge color for this Spring/Summer and color-blocking with the Mint is so chic. 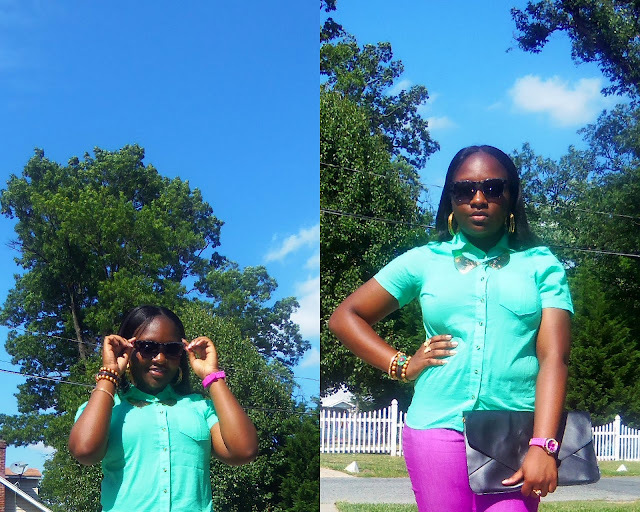 I paired this Mint shirt I got from Forever 21 (I know, I am obsessed with Forever 21..LOL) with a grape colored jeans also from F21. I accessorized with Gold jewelries and a pair of black pumps from ShoeDazzle. Hope you like my outfit. Wearing a pair of collar necklace with a shirt adds more sophistication to the plain shirt. Envelope Clutch & Arm Candy! Thanks for visiting my blog and have a wonderful evening! i really love your look honey! Thanks Tere! I am glad you like my look. 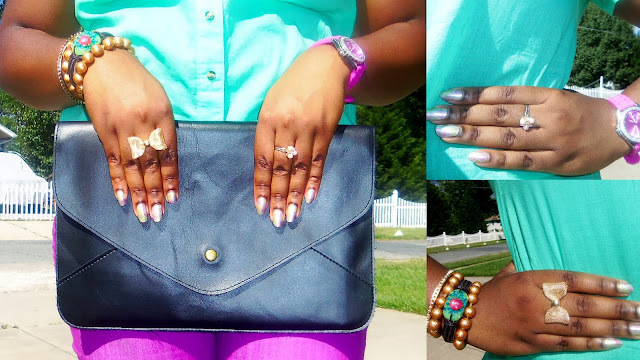 Love the mint+lavender look- Awesome color combo!! I love tha whole look, its great, and u are doing a great job wit tha color blocking, and also congratulate ur brother on his big day for me, IT'S GREAT TO SEE A YOUNG MAN WALK ACROSS THA STAGE, AND PREPAIR FOR BIGGER THINGS IN LIFE,I LOVE UR LOOK!!!! Thanks for the love Ms. Huddygurl.